The EMS Nomad: EMS and Firearms - What are the current laws pertaining to EMS carrying firearms? EMS and Firearms - What are the current laws pertaining to EMS carrying firearms? PA is a rather pro-gun state. Commonwealth Licenses to Carry Firearms (LCTF) are shall-issue, and inexpensively available from every county sheriff. PA is also an Constitutional Open Carry state, wherein carrying of a firearm openly visible in a holster is legal so long as you aren't in a vehicle or in the City of Philadelphia. A LCTF is required to conceal a firearm in public, or carry one openly in Philadelphia. If you are carrying a firearm as a duty of employment, then you enter into territory governed by the same laws as armed security. That requires some level of training and certification above the “average citizen” in many states. There are a few places where carry is either legally questionable or prohibited. These include primary/secondary schools, jails/courthouses/correctional facilities, and areas that are federally prohibited, like federal buildings and the secure section of airports. 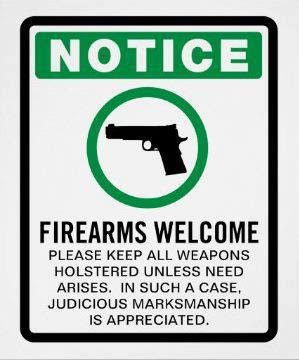 Additionally, many other businesses post signs that indicate they would prefer folks not bring firearms onto their premises. Oh, and as always, I'm not a lawyer. This isn't legal advice, etc, etc, etc.